Legend has it that Shem’s offspring (or “seed”) migrated from the Middle East into Asia and the Far East. Although not scientifically proven, it is possible that the descendants of Shem were the first people to cross the Bering Land Bridge into North America where they eventually entered present day Michigan. These first inhabitants, popularly known as “Indians,” left behind an interesting assortment of artifacts which provide us a window into Michigan’s prehistoric past. Today’s popular view of human history embraces the evolution model of origins whereby humans (Homo sapiens) developed from hominid ancestors approximately 250,000 years ago. We reject this premise as both science and scripture support a young earth creation model. We believe that all humans came from Adam and Eve and from Noah’s family after the Great Flood. Humans have always been humans. 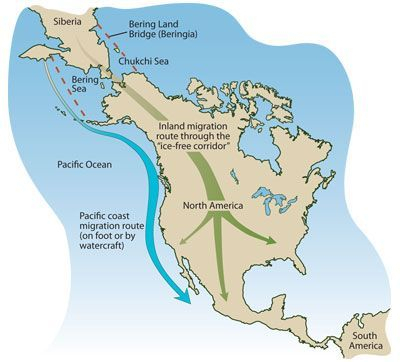 It is possible that other prehistoric people from Europe (descendants of Japheth) and Africa (descendants of Ham) arrived in the Americas before, during or after the Bering Land Bridge migrations. As avocational archaeologists we are excited to share our knowledge and collection with you! The Burns Family started collecting authentic artifacts in earnest after a 2010 family vacation in southern Ohio where several mound and settlement sites were visited. So far the family’s documented collection consists of several stone tools received as gifts and many artifacts found through surface hunting – both land and water. As avocational archaeologists we are mainly interested in collecting and studying artifacts of the prehistoric people of Southwest Michigan. Jim Burns loves to write and give presentations on the subject. We follow responsible surface hunting practices and maintain meticulous records of site provenience for all of our authentic personal finds. Many of the authentic artifacts you will see pictured throughout this website were recovered from the surface of disturbed sites where the original context of the find has been lost. We do not support digging on what may be potentially significant archaeological sites without first consulting professionals. The authentic lithic tools pictured on the following pages are for your viewing and educational pleasure, however none are for sale. We hope that you find your tour through our online artifact gallery and information pages enjoyable and educational. We collect and study prehistoric artifacts due to their beauty, unique craftsmanship and the story that they tell. Eventual goal: Interpret the Paleo, Archaic, Woodland and Mississippian periods from a young earth creationist perspective.